An exciting sweepstakes based on college hoops! Over $2,000 in prize money! 75 different ways to win with each game card! Enjoy the excitement of your office “bracket pool” without the stress of picking teams! Have fun while supporting a good cause! Do you enjoy college basketball’s national championship tournament, but you feel a bit lost or overwhelmed filling out a “bracket” for your office pool? If so, HoopsMania is for you! When you have a HoopsMania game card, you can win up to $500 in prize money by just sitting back, watching the games, and rooting for the teams printed on your game card. The more points your teams score in the tournament, the better chance you have to win one of the top 70 prizes! If your teams don't perform very well, the bottom 5 game cards also win. This sweepstakes makes the tournament exciting for even the most casual fan! In this Edition of HoopsMania, each game card holder is assigned 8 teams (2 teams from each region) that will play in college basketball's national championship tournament in March. Each game card has a 1 through 8 seed so all game card combinations have a great chance of winning. 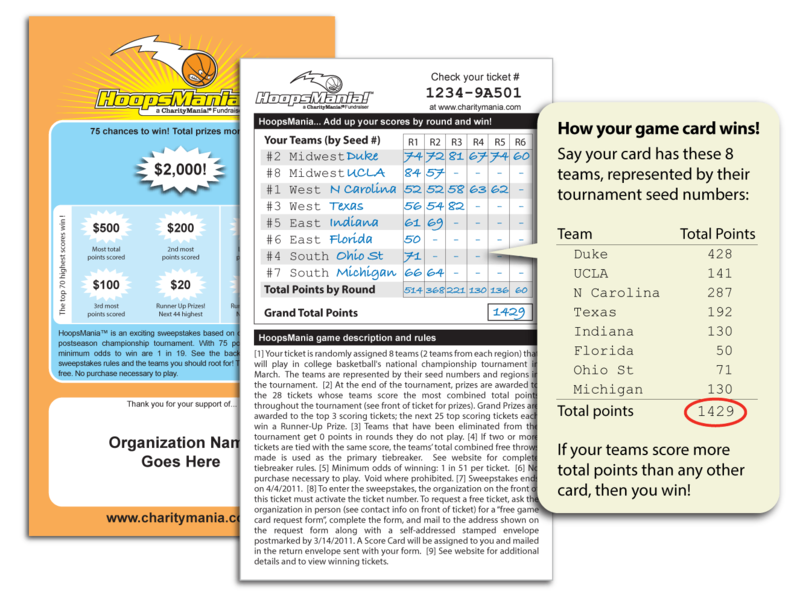 When the basketball tournament begins in March, game card holders simply add up the points scored by the teams printed on the HoopsMania game card. The more total combined points the teams score, the better chance a game card has to win a prize! At the end of the tournament, prizes are awarded to the 70 game cards whose teams score the most total combined points throughout the tournament. The top 3 scoring game cards are awarded a Grand Prize; the next 67 top scoring game cards each win a Runner-Up Prize. Prizes are also awarded to the 5 game cards with the lowest total combined points. See below for complete prizes or view the HoopsMania official rules for more details. Read the official rules for more details. There are 1,440 unique game cards, each of which has an equal 1 in 19 chance to win a prize. Prize money amounts can be seen in the table below. Once you have your game card, you can track your game card's score at any time to see how well you are doing. There are two easy ways to do this. Option 1: just enter your game card number on the CharityMania website; Option 2: download our free HoopsMania iPhone app (if you have an iPhone) and play along.